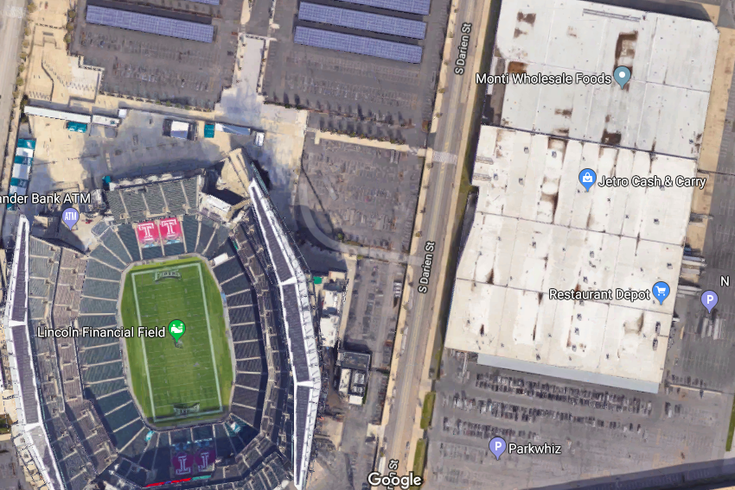 A satellite image on Google Maps shows the large Jetro Building (right), behind Lincoln Financial Field in South Philadelphia. A nonprofit led by former Gov. Ed Rendell and longtime Philly sports executive Lou Scheinfeld plans to open a 25,000-square-foot museum dedicated solely to sports inside the building by 2019. Heads up, Philly sports fans. A museum entirely dedicated to your hobby is coming to South Philadelphia. What's more, The Museum of Sports will celebrate sports across the United States but will have a particular focus on the history of sport in Philadelphia, officials said in an announcement on Wednesday. The endeavor will cover 25,000 square feet of space within the Jetro Building at Pattison Avenue and Darien Street, behind the sports complex where the city's four major professional teams play. The project could cost $8-10 million and is set to open in 2019, NBC10 reported. The museum is spearheaded by a nonprofit led by former Pennsylvania Gov. Ed Rendell and longtime Philadelphia sports executive Lou Scheinfeld, among others. A website for the museum states that organizers plan to stock the museum with "world-class collections of priceless memorabilia, a high-tech array of digital and virtual reality activities for families and schools." Among the museum's attractions will be a vast collection of sports memorabilia from collector Dr. Nicholas Depace, who plans to close his Depace Sports Museum in Collingswood and move his collection into the Jetro Building, according to NJ.com. Depace is listed as a vice president for the new museum. The museum is also set to include a theater, a sports-themed restaurant and shops for collectibles and memorabilia. Rendell is heading fundraising efforts, which are about a quarter of the way toward the $8 million goal, CBS3 reported. Rendell hinted that he may seek a state grant to help foot the bill. Early plans for the proposal were first reported in 2016.